Davis Partnership Architects, in-collaboration with Bennett WagnerGrody Architects, recently completed construction of Kaiser Permanente’s 275,000-sf multi-specialty clinic in Douglas County, CO.
A flagship of Kaiser Permanente’s extensive range of healthcare services in Colorado, the facility includes a six operating room outpatient surgical suites, eight-room endoscopy center, as well as an extensive imaging center that includes nuclear medicine capabilities. 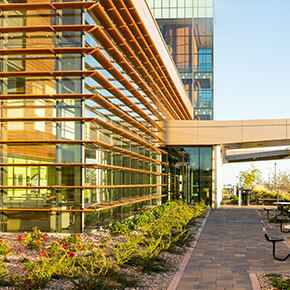 The building provides space for various clinics and their supporting services; an orthopedics clinic includes a physical therapy gym, optometry/ophthalmology services are located near a full-service optical services store, and an oncology clinic opens into an infusion center that enjoys expansive views of the front range. The building provides for both present and future needs as well, with a fully shelled top floor. A complete multi-phased master plan was conceived from the inception of this project. 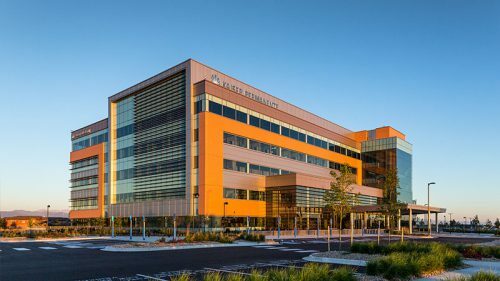 The 20 acre site stretches over 1600 ft. in the North/South direction and is expected to support three medical offices totaling nearly 600,000 SF and the parking to effectively support it. The first phase is intended to be the central organizing element that connects the campus together via the common circulation spine. The design seamlessly integrated the major interior spaces and landscaped outdoor rooms with the architectural expression of the facility. The three disciplines, working as an integrated team, actualized the successful design of the initial phase as well as the vision for the final build out of the complete campus.